Our feature race was the last race of the day Sunday. J.K. was the driver, and he ended up turning a fast race lap of 1:58 in the feature. That’s quite an improvement over our time from last year. At 7:00 Wednesday night, we were still in Florida, putting the finishing touches on our Triumph TR3 mini restoration. That weekend, we were due to be racing at Mid-Ohio. As we mentioned in the August issue, after Sebring we decided to fix a couple of things, as we found way more problems than we anticipated. Therefore, we ended up doing what seemed like an entire restoration and race prep on our TR3 project car. A generator problem turned into an alternator conversion, which turned into a polarity conversion, which turned into a battery relocation, which turned into an interior stripping and painting, which turned into a roll cage redesign—and so on and so on. 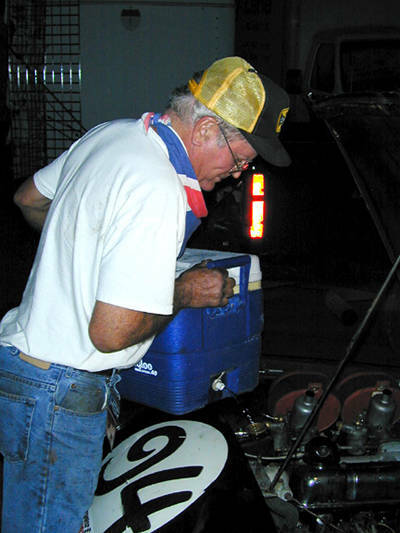 The ever-resourceful J.K. Jackson fills the TR3’s radiator after a waterpump replacement. Despite our fatigue when we reached Mid-Ohio, we were confident that our year of experience with the car plus the improvements made to the car would yield better lap times, given equal track conditions. Because of a trailer hitch problem (it broke right in half), we arrived Friday afternoon with just minutes to get ready for our first session. Co-driver J.K. Jackson was first up, and the plan was to take it real easy to make sure the car was right after making so many changes. J.K. kept the rpm limit at 5000 and came back with a big smile on his face. He had turned a 2:03 lap first time out, which was about as fast as we had gotten the entire weekend at last year’s Mid-Ohio event. Our new Hoerr Racing/Kirkey seat and addition of a dead pedal made the car much more comfortable, and it looked like we were in for a good weekend. Tim was up next, first thing on Saturday morning. The car felt great, and Tim ran flat two-minute lap times. His previous best at Mid-Ohio was about a 2:05. We were ecstatic. The qualifying race was that afternoon, and Tim was scheduled to run again. Things seemed well during the qualifying race until he heard a loud thud and quickly spun around at the entrance to The Keyhole. We couldn’t believe it—some driver had punted him. That had never happened to Tim before. When you are strapped into a race car, and somebody hits you from behind, you have no way of knowing whether your car is totaled or if it has just a scratch. The car still ran, it still moved, and the corner workers didn’t black flag Tim, so he kept going, slowly at first and then with the furor of somebody who had just been punched in the mouth. Tim was determined that there was no way he was going to finish DFL, so he set my sights on the TR3 in front of him and reeled the car in. During this two-lap battle, a couple of things became very clear to Tim. 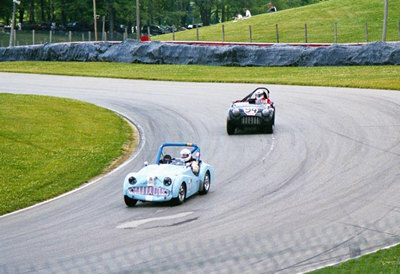 First, if the TR3 looked that squirrelly on the track, then we shouldn’t be racing it. Second, despite the fact that the guy in front of Tim obviously had more motor than we did, Tim could easily out-handle and out-brake him. Tim tried a few times to get by the other car and realized it wasn’t going to be under acceleration. Tim thought it through and decided he could out-brake the other car at the end of the back straight, cut under and take the lead. It worked like a charm, as Tim quickly overtook the other driver and never saw him again until they got back to the pits. 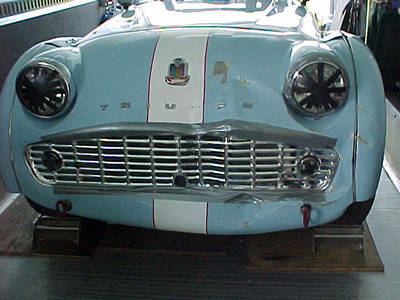 To our surprise, when we saw the other TR3 in the pits, the front end of that car was bashed in. This was the guy that hit Tim! He later came up to us and apologized and even offered a taillight as a parting gift. We took the taillight but still coveted his nice, straight spare tire compartment panel. Oh well, that’s just part of racing. When we looked over our accident damage, we realized it wasn’t bad at all. 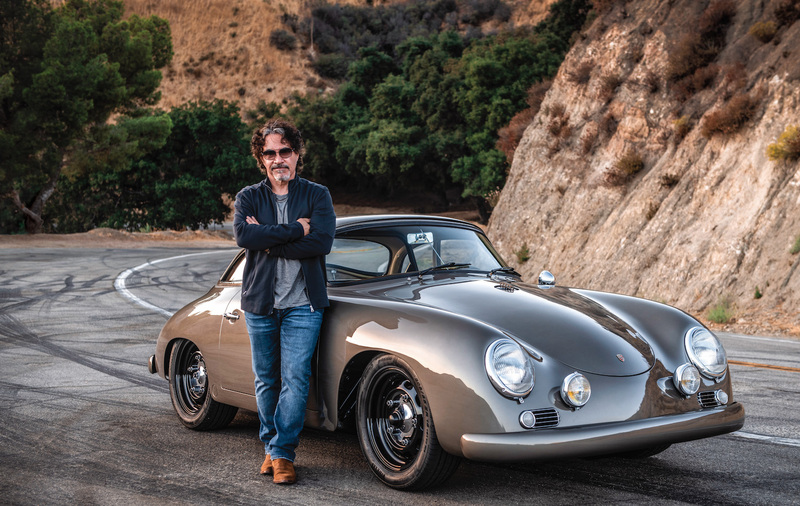 We could continue racing, and we could fix the body work in an afternoon or two. What was of greater concern was the horrible rattle from the top end of the engine. J.K. pulled the valve cover and checked and adjusted everything. Everything appeared fine. Then we found the problem: The water pump had completely disintegrated, taking the pulley with it. We had an extra pump with us, but no pulley. TS Imported’s Ted Schumaker gave us a phone number of a local British car guy named Al Hogan. Al said he had one, and we could just walk into his very (I mean VERY) eclectic junkyard and grab one. We found one (Thanks Al!) and were back in business. Sunday morning arrived with flawless weather, and we were all set for our enduro. The plan was for J.K. to drive first, and Tim would finish the race. Our expert crew consisted of fellow FOT (Friend Of Triumph) Internet club members Rick Aust and Henry Frye. The enduro went without a hitch, and we finished fifth out of seven cars. Yes, an engine development program is our next plan of action. Despite not winning, Mid-Ohio was a very successful weekend. We are really starting to learn the car, love the car and respect her abilities. With a little more engine and a little more seat time, we are confident we can run with anybody in our SVRA Group 3E.